AUTHORISED & TRAINED RETAILER OF RECARO. 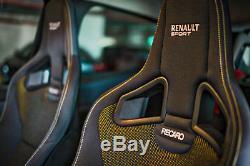 Genuine RECARO Renault Clio 197/200 Fabric. A common issue with the RECARO Sportster CS seats fitted to the Renault Clio models is that the fabric on the top of driver's side bolster foam can start to wear through use, due to the design of the seat and the perceived lack of resilience in the fabric. As the official UK importer for RECARO Automotive seats, we have managed to source the original fabric in order for you to make repairs to your bolsters as they become damaged. 700mm x 400mm, which is enough to recover one bolster. The fabric will need to be taken to a local trim shop to make the repairs, as these pieces sadly cannot be supplied ready made to fit. The fabric is suitable for the below RECARO seats in the Clio, with the yellow centre fabrics. There are other Sportster CS seats fitted to the Renault Clio models with different styles of seat centre fabric. The material advertised is not a direct replacement for that, but is a relatively close match. We aim to complete your order within 24-48 hours of completing checkout. Examples are Scottish Islands & Highlands: (AB31 to AB38, AB40 to AB53, IV1 to IV28, IV30 to IV32, IV36 to IV40, IV52 to IV54, IV63, KW1 to KW14, PA21 to PA38, PH4 to PH50)(HS, IV41 to IV49, IV51, IV55 & IV56, KA27 & KA28, KW15 to KW17, PA20, PA41 to PA49, PA60 to PA78, PH42 to PH44, ZE). Northern Ireland, Isle of White etc. Should your postcode reside in a'premium' region, we will contact you before the item is dispatched to confirm additional cost. Expert advice on seating solutions and seat information. Established in 1968, Capital Seating specialise in the supply of suspension seats and accessories to improve driver safety and comfort for all types of vehicle. Capital are official distributors for major brands including KAB, Grammer, ISRI, Sears and Pilot, and we are the official UK importer for RECARO. We supply a wide range of market sectors, and cater directly to OEM, trade and retail customers. We have over 30 years association with the supply and resale of RECARO seats and spares with a vast amount of knowledge gathered throughout the years. We are also the UK importers for RECARO automotive with set dealers across the UK to distribute the RECARO brand. We also have been in business for over 50 years dealing in vehicle/seat upholstery and the supply of seat solutions. 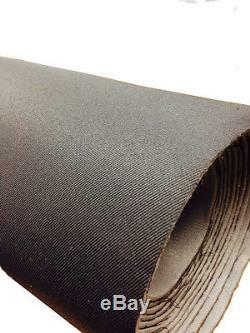 The item "Genuine Renault Clio 197 200 RECARO Fabric for Sportster CS Sport Seats" is in sale since Tuesday, March 11, 2014. This item is in the category "Vehicle Parts & Accessories\Car Parts\Interior Parts & Furnishings\Other Interior Parts & Trim". The seller is "capital_seating" and is located in Leicester.